The jump in power consumption at 10A is because the fan turns on. 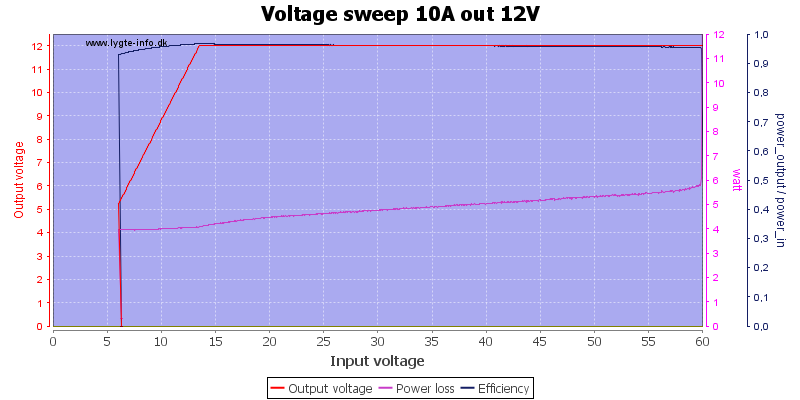 The fan can also turn on below 10A if the heatsink gets warm. 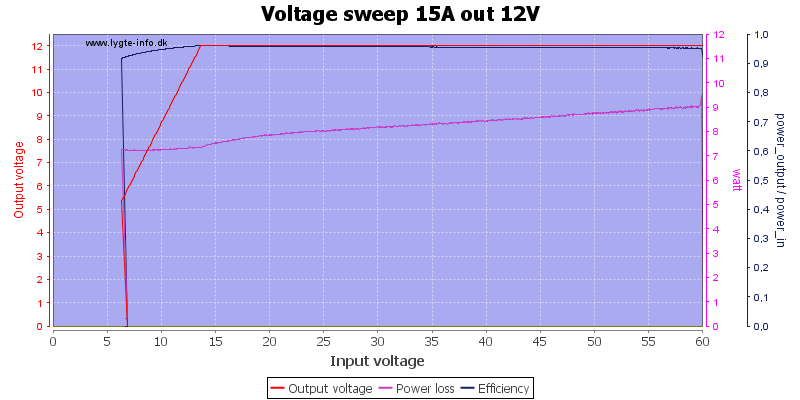 The 15A load is too close to the current limit, output voltage is maintained, but is fairly noisy. The specified minimum voltage is 6V and it turns off just below that. 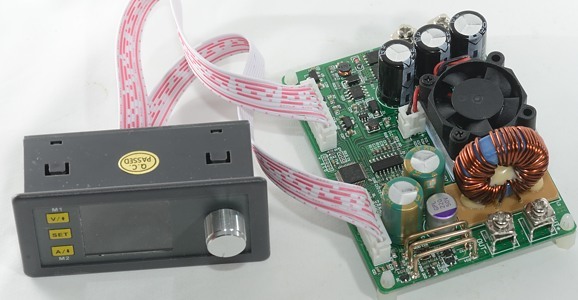 At 4 watt output (1A at 4V) the efficiency is fairly low, because the power for the regulation and display is a significant part of the input power. When the input voltage is close to the output voltage, it cannot maintain the output voltage. 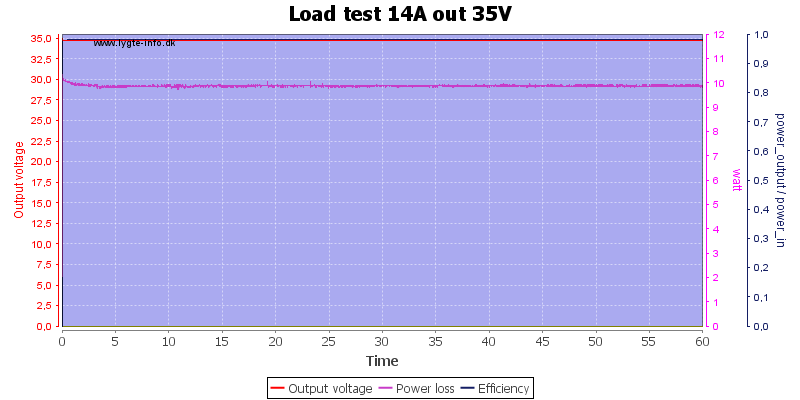 The volt reading will show the lower output voltage, but there is no warning (Like a flashing voltage readout). 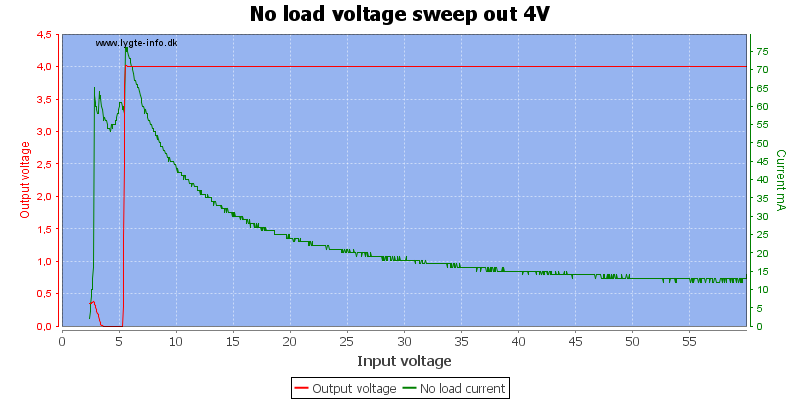 Running very close to the current limit can have problems. 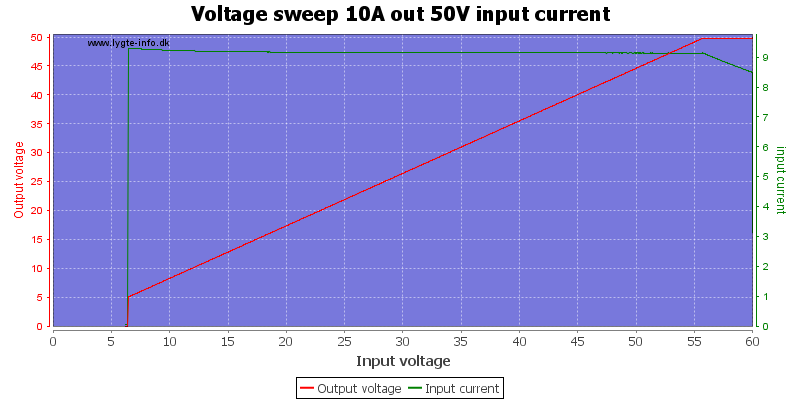 This power supply has a constant current mode, these two charts show how it works at different input voltage. 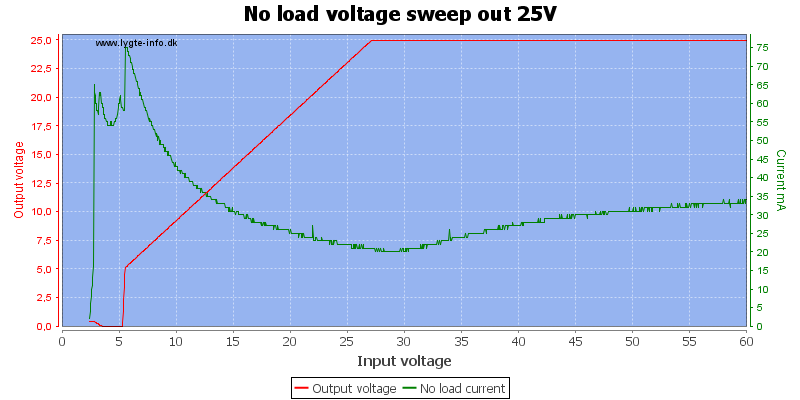 When pressing the on/off button to turn output on the voltage is "slowly" regulated up to the selected voltage, here without load. 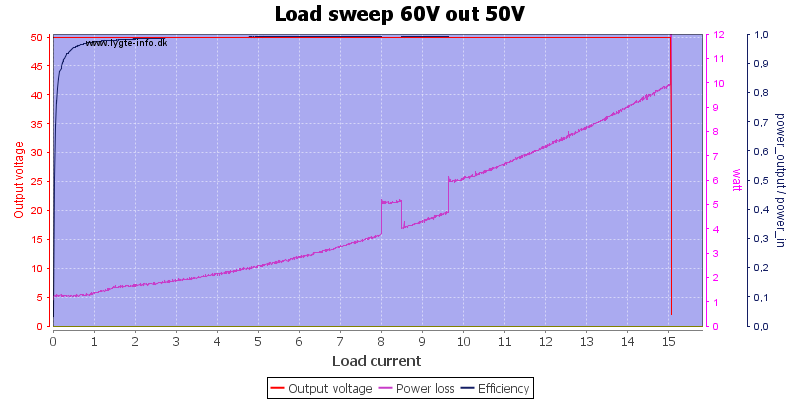 And here with a load. 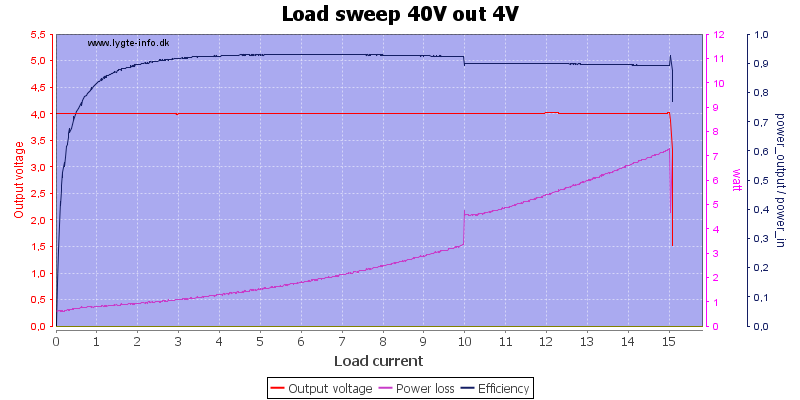 Pressing the o/off button to turn the output off is a bit slow when output is unloaded, the output capacitors maintain output voltage some seconds. 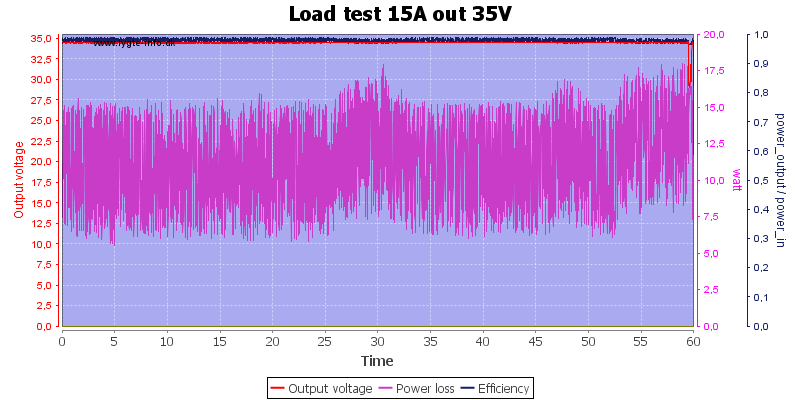 With a 1A load the time is fairly short. 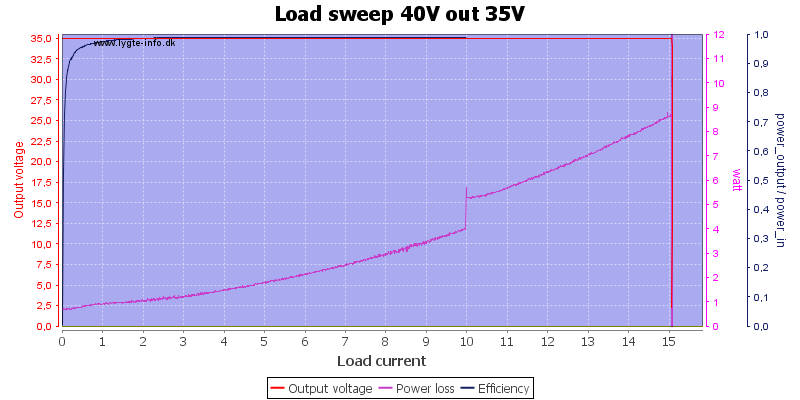 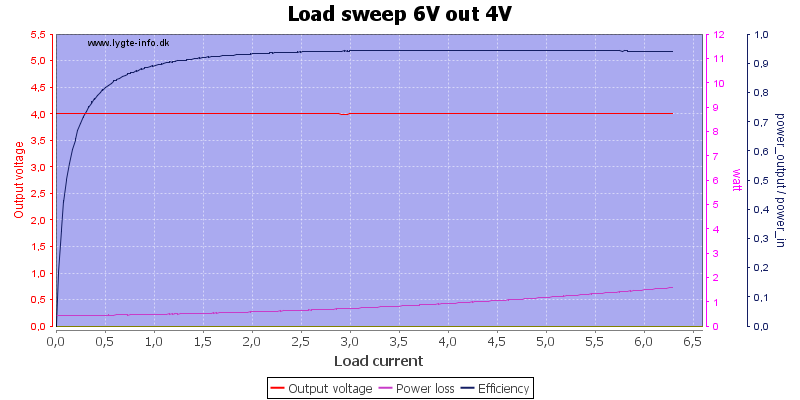 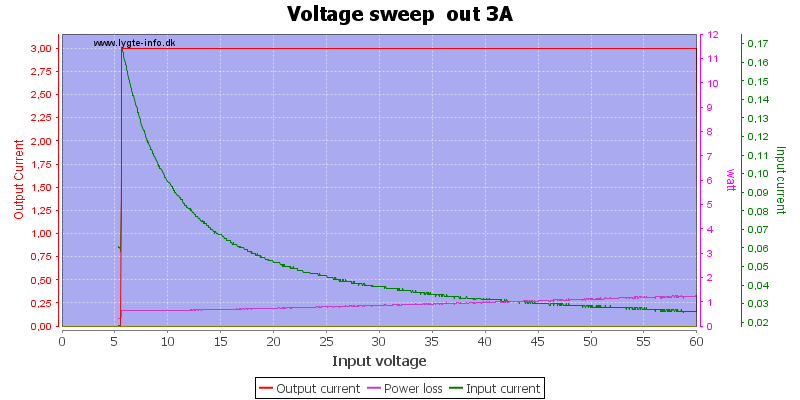 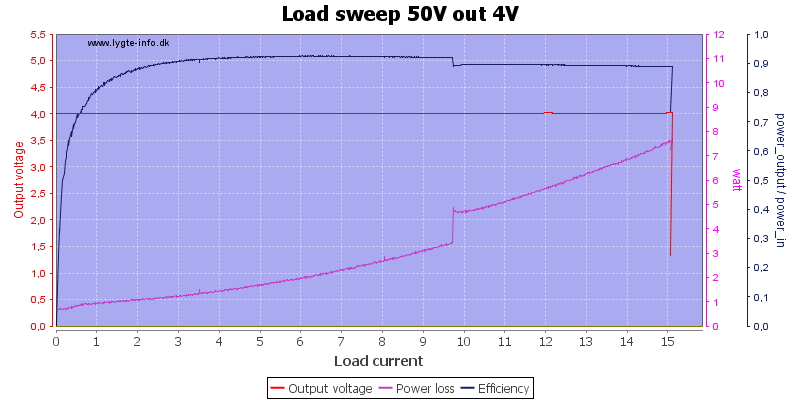 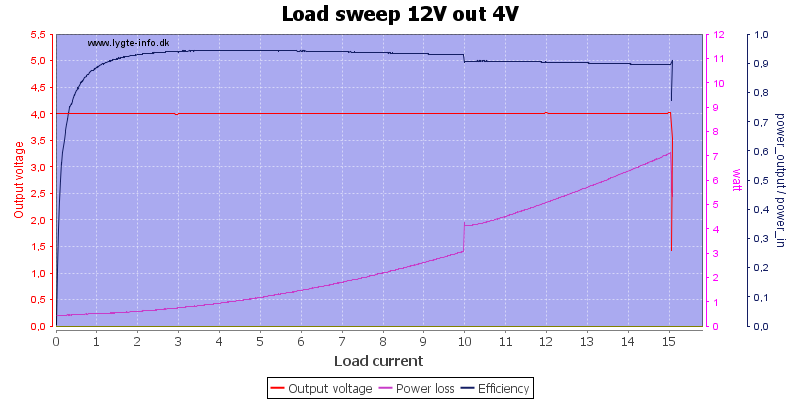 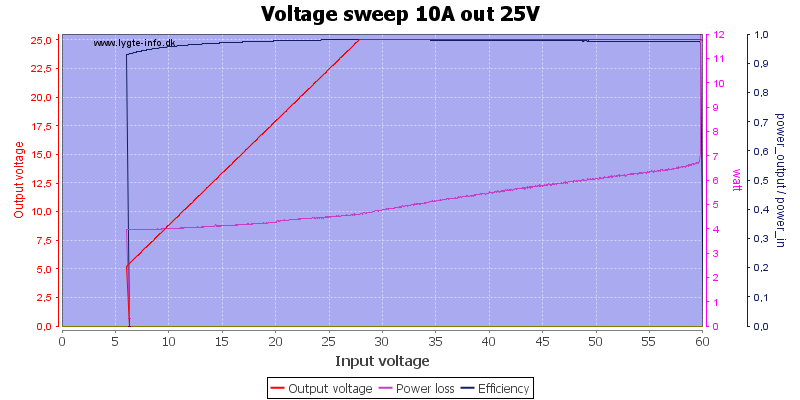 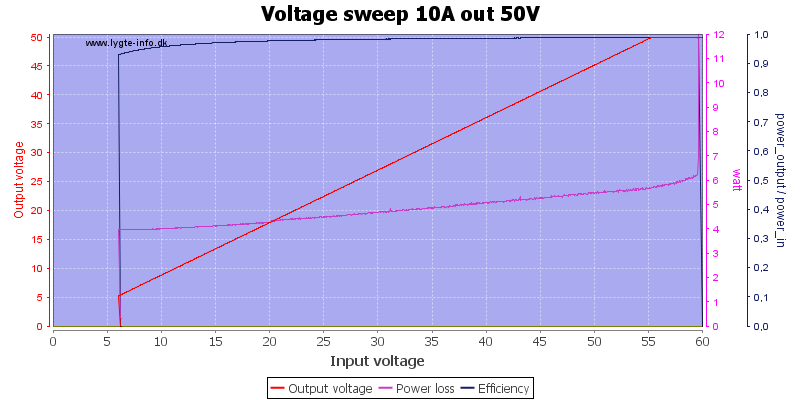 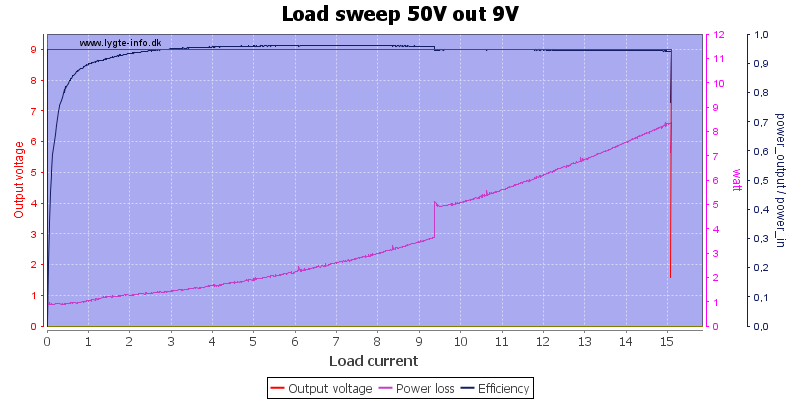 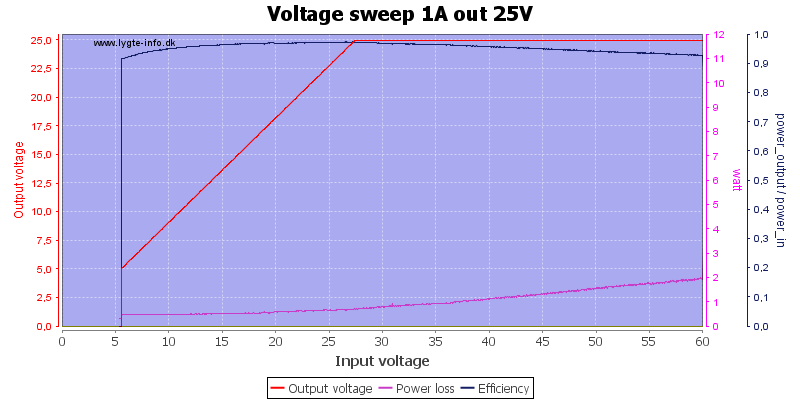 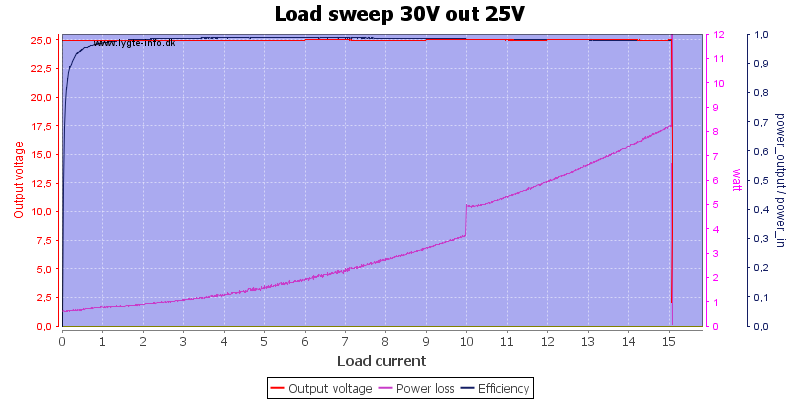 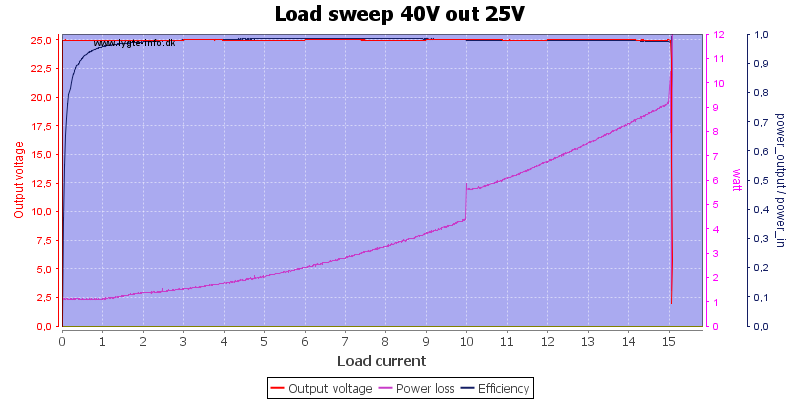 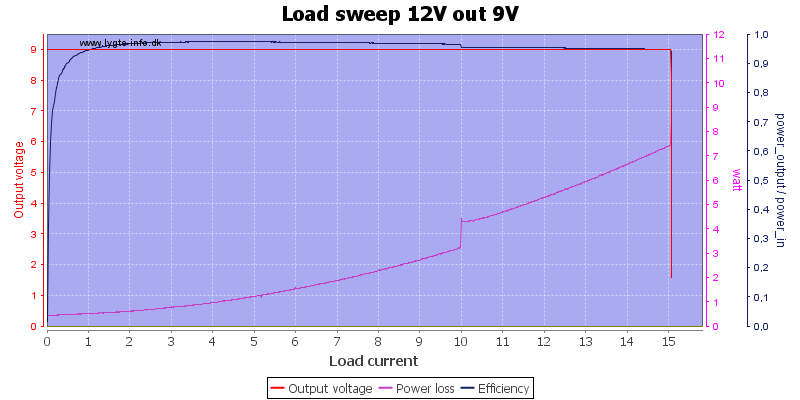 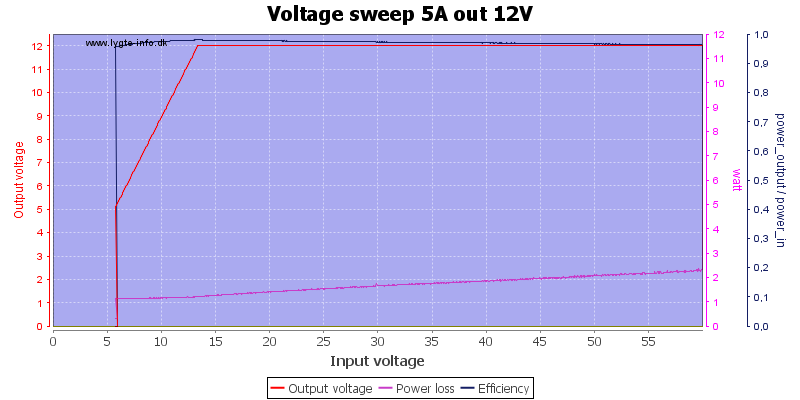 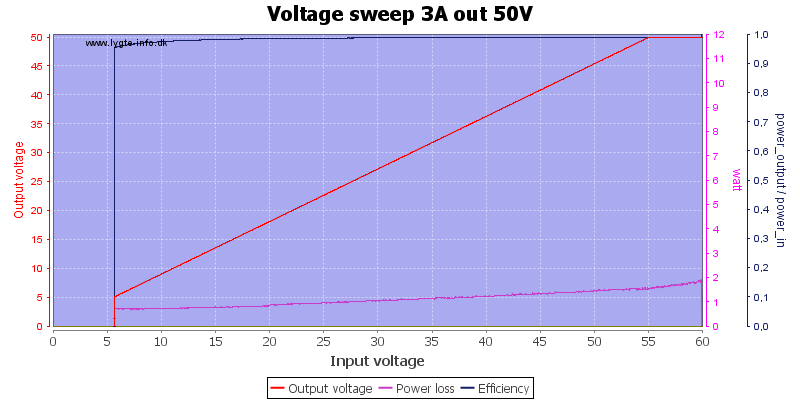 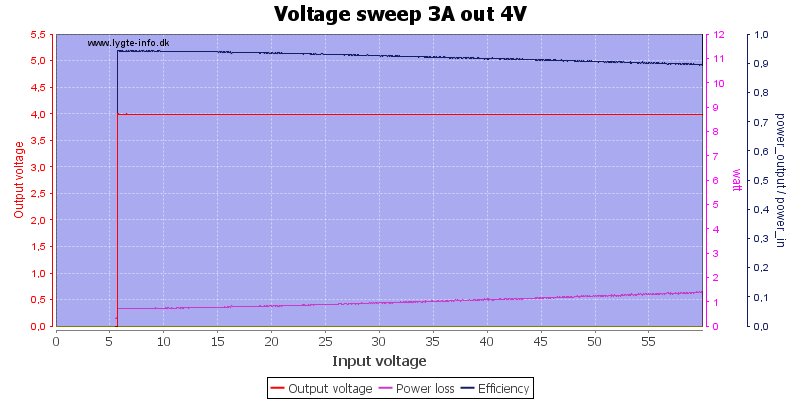 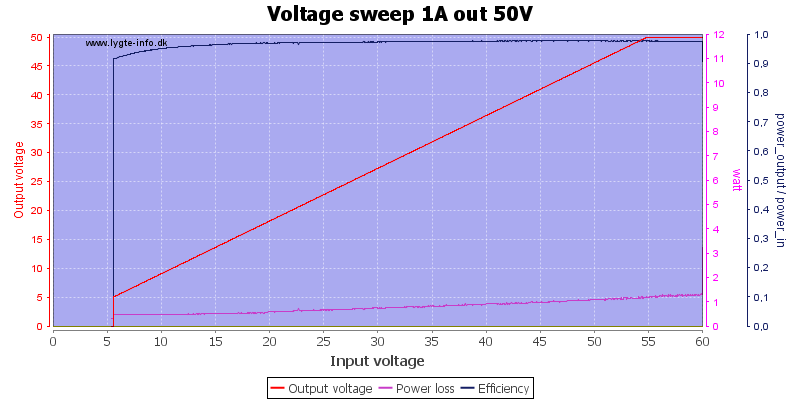 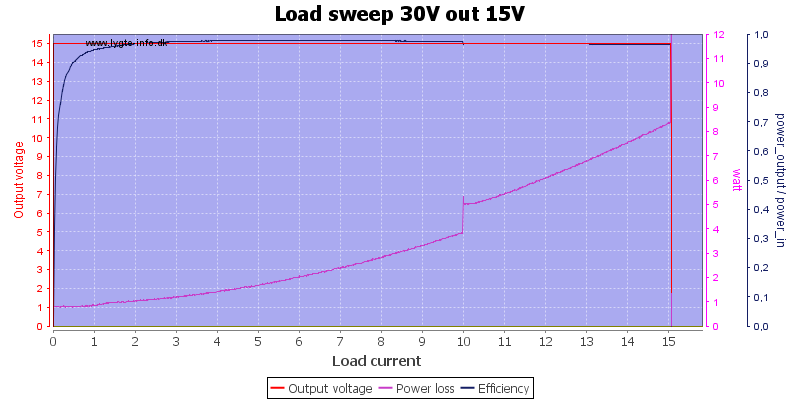 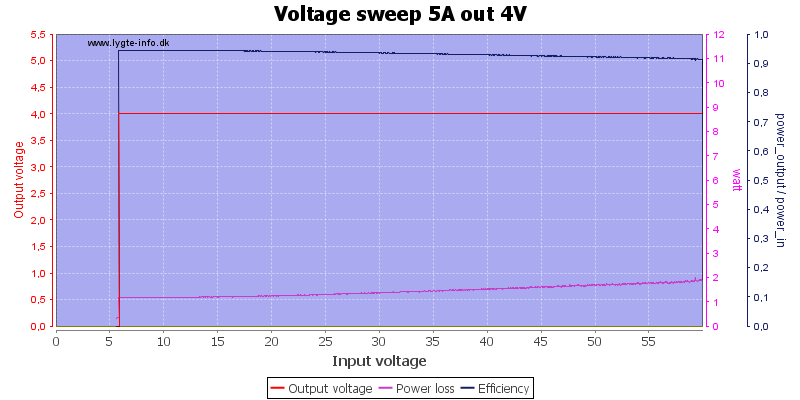 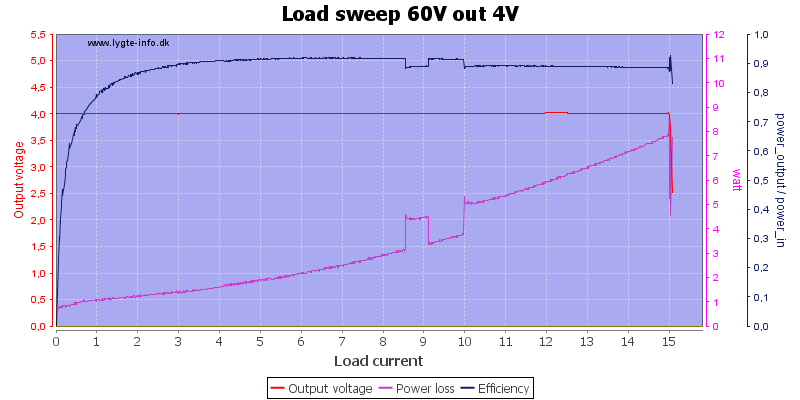 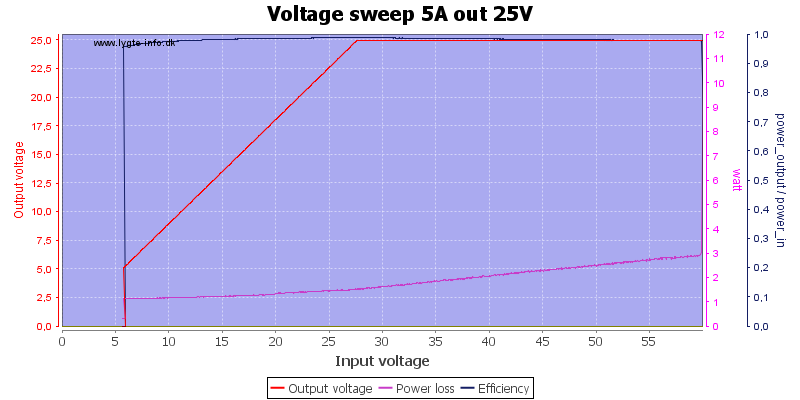 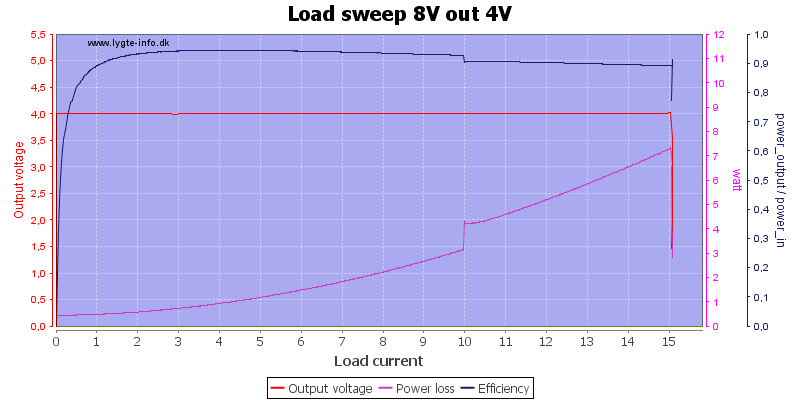 At 50V output it takes more than 30 seconds before the unloaded output has dropped to zero. 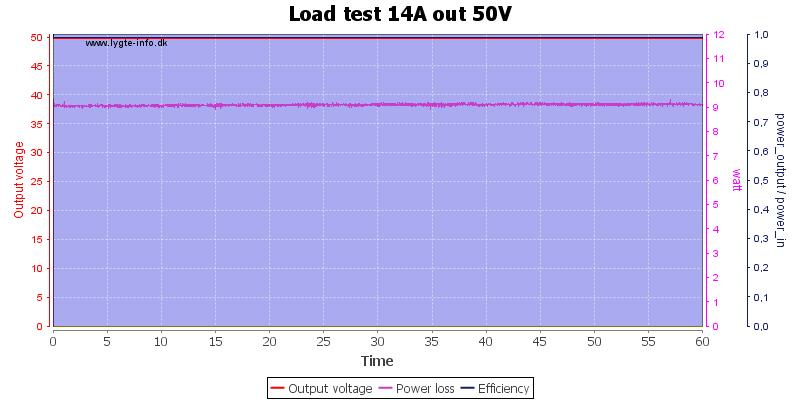 Again, with a load it happens in a fraction of a second. 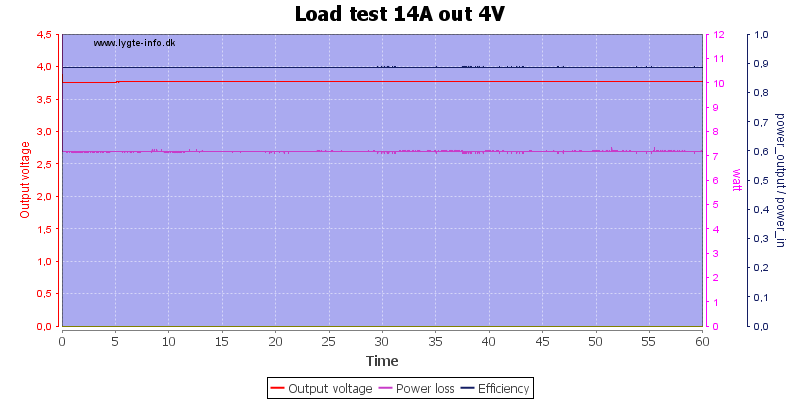 Going from zero load to 14A load do not change the output voltage, but it will increase the noise. 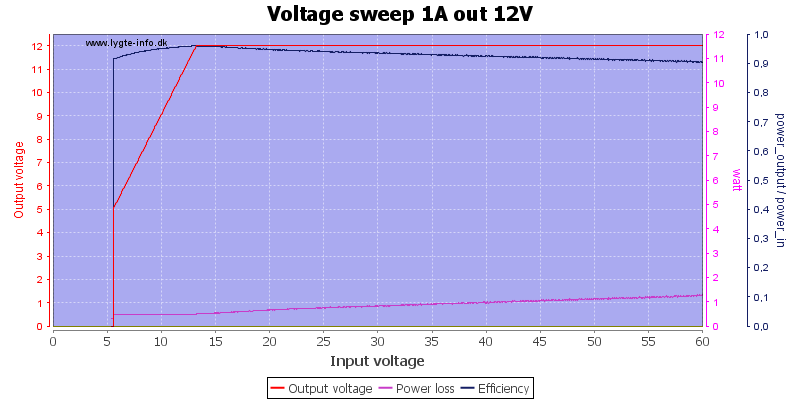 At 12V there is less noise. 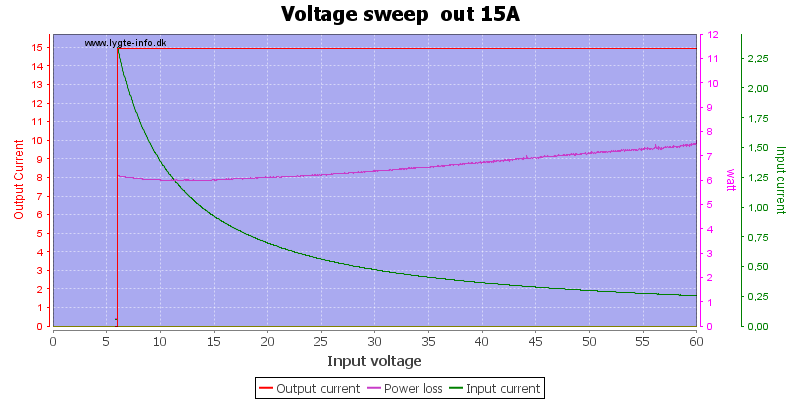 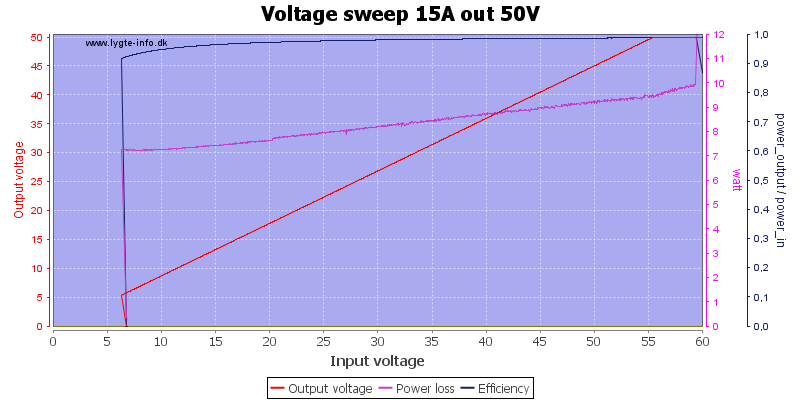 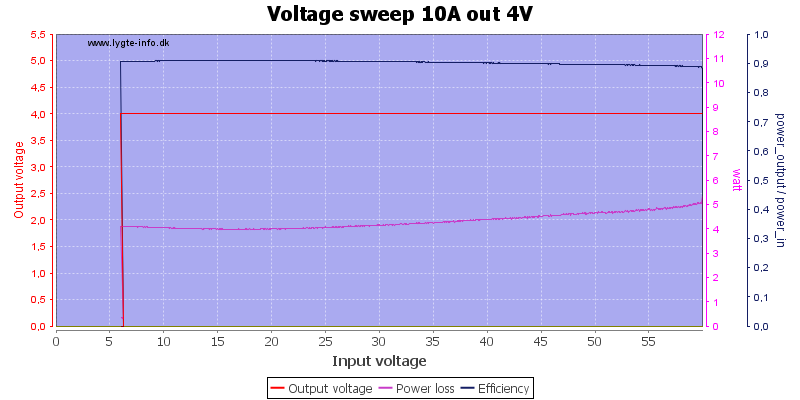 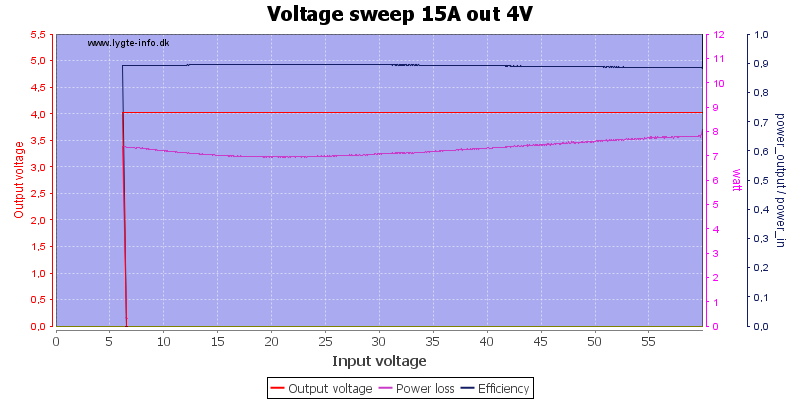 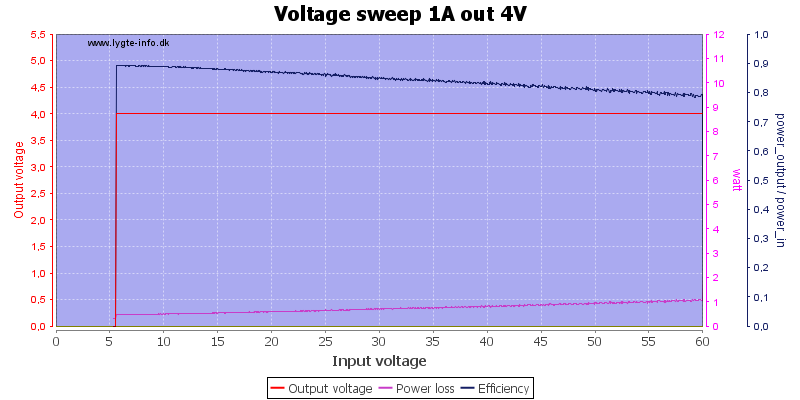 Turning a 15A load off at 4V will increase the output voltage with abount 0.5V for a fraction of a second. 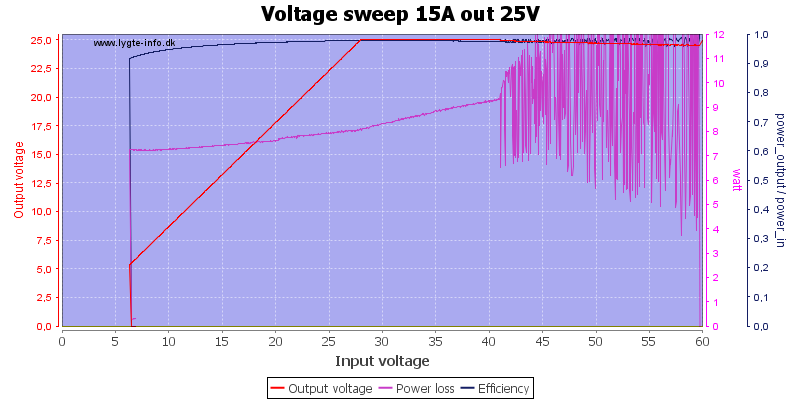 There is some noise in the output. The shape depends on the input voltage. Yhe noise is about the same in constant current mode. Analyzing the spectrum shows that the circuit is switching at 64kHz (That can also be seen on the charts above).